Raul Castro is in Russia for a week-long state visit. So far, Castro has put 30 deals into his pocket and, as a bonus, was able to satisfy his appetite for Russian traditions. Soviet news showed Castro arriving on a Soviet Ilyushin airplane, escorted by MIGs – an unheard-of honor. Although, in reality, Fidel had secretly landed earlier in Russia. He was first taken to Murmansk where he got a glimpse of Russian nuclear missiles. 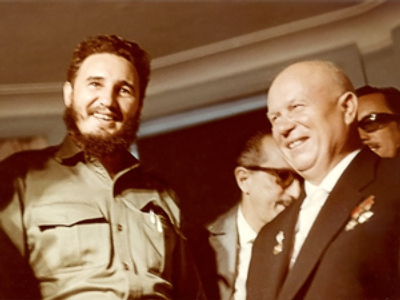 Also in 1963 Fidel spent 45 days traveling in the USSR. Everywhere he went he was met by cheering crowds. Times have changed…But when his younger brother landed in Moscow this week it was again on a Russian made Ilyushin…the type that’s usually used by Russian leaders. This visit couldn’t boast the Soviet-era pomp but the symbolism remained…Russians still affectionately call Cuba an “Island of Freedom” and contrary to the Soviet Iron Curtain times, many choose Havana as a holiday destination. While in Russia, Raul Castro has decided to stay at the Russian state residence in Tver region, outside of Moscow. He came well-equipped with a warm coat and ushanka hat. Medvedev greeted Castro like an old friend, although they both met for the first time just two months ago when the Russian president landed in Havana, along with a contingent of the Russian Navy. “I'm very glad to see you in Russia and especially at this place which I know you visited many years ago. I even have a film about Fidel's stay here and some interesting pictures,” – the Russian President said during his greeting. Medvedev got the hint, laying on the top traditional Russian hospitality filled with delicacies. After talks, the two went outside for a dinner by the fire… with pickled vegetables, barbecue, samovar and certainly the most important dish. “Here’s lard – something you should have come for!” – said Medvedev as he passed the plate to the guest. These were the first joint talks at such a high governmental level in 25 years. 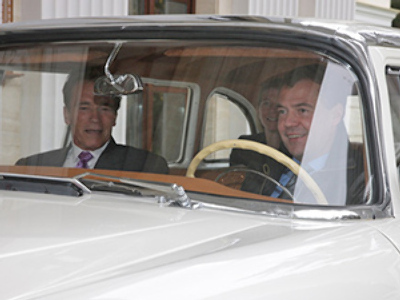 Medvedev and Castro seemed satisfied, chatting every time they had a chance. 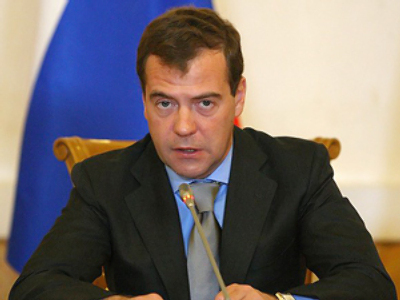 It is still a mystery how – since Castro doesn’t understand Russian or English and Medvedev doesn’t speak Spanish. At one point, Medvedev grabbed a paper and began drawing to explain something to Castro. Both countries avoided discussing military ties – at least in public. However, the frenzy behind this particular issue between Havana and Moscow is easy to understand. For some 30 years there was an alliance of brothers in arms. Communist Cuba sits right at the U.S. doorstep and Soviet leaders were glad to use this thorn in the side of Washington by reinforcing military cooperation. In the 1960s it led to the Cuban Missile Crisis – a major stand-off between the two superpowers that brought the world to the brink of nuclear war. Mikhail Kamynin, Russian Ambassador to Cuba, said today the countries “focus on economic and humanitarian relations but military contacts cannot be ignored”. Russia shut down its military base in Cuba in 2002. When Medvedev landed in Havana and was followed by a contingent of the Russian Navy, many saw it as a sign of Russia’s military comeback in the region. So far, the fleet that will next dock in Havana will be only for commercial fishing. “We used to draw one million tons of fish a year, we are going to come back” said Andrey Krajny, the head of the Russian Fishing Agency. Also, Russian energy companies are planning on developing oil fields around Cuba. Further, Russian “Inter RAO” is going to build a power station on the island. The countries also sealed deals in auto manufacturing, mobile communications and pharmaceuticals. Cuba will also receive a multimillion dollar loan on top of the 300 million they received earlier. Additionally, Russia has a bulk carrier loaded with grain ready for shipping as humanitarian aid to Cuba. But the symbolism of this meeting might be more important than the agreements that were thrashed out – as old friends are rebuilding their ties anew, this time with no ideological backing.